But I am not in Seattle. I couldn’t attend this year. Maybe it is a good thing that I am not there. As much as I love coffee and my friends in the industry, my relationship with coffee right now is troubled. Coffee is now making me feel both good and awful at the same time. We all have unique responses to coffee and caffeine. Those responses vary wildly from person to person. Those responses change over time. We are all unique. Sharing links to some study that a majority of individuals in some group achieved a minor health benefit from consuming coffee is meaningless to a group ALREADY consuming coffee. Please don’t send me any stories that glamorize the health benefits of coffee. I won’t read them, because they do nothing to improve my health. Remember, we are already drinking coffee. The only people who might benefit from these stories are people who love and can tolerate coffee, but have stopped drinking it for fear it was damaging their health. That isn’t us though. Despite this article, people keep sending me links. Usually the links are from mainstream news and I usually get the same link sent to me multiple times. Please Stop It. The mistake people are making is taking an average positive response and then applying to everyone. We aren’t machines. Our responses vary and they may vary in ways that are hard to quantify. I spent 2.5 years of my life tracking my daily coffee intake trying to find the perfect number of coffees I could drink for optimal health. In the end the only thing I learned was a late afternoon coffee between 2 PM and 4 PM actually improved my sleep. What I have learned is that I can feel energized and great on both a low amount and a high amount of coffee. And I can feel run down and lethargic on high or low levels of coffee. I can’t say with any confidence that X number of coffees is right for me. It might be right for me that week or that day, but beyond that I don’t know. Although there have been times that I consumed more coffee, I haven’t felt this addicted and rundown to coffee in a very long time. One of the problems that I have trouble explaining to people who aren’t really into coffee is that the flavors coming out of coffees in the last few years are not just a little bit better, but A LOT BETTER. Coffee and especially espresso is now going through almost a Moore’s Law increase in quality. The quality at the farm improves. This changes how the roaster roasts the coffee bringing out new flavors. Then the espresso machine manufacturers start adding features to further highlight those flavors. At the cafe, the baristas are better trained to prepare that new coffee. The result is espresso and some brewed coffees from the top roasters and cafes is exponentially better than it was 5 or 10 years ago. Yesterday a new La Marzocco espresso machine was announced. If you don’t understand this article and what it means, let me just say that for an espresso aficionado like myself, this will turn cocaine into crack. One of the topics I have been posting about this year is food reward. …at equal calories some foods provide greater flavor reward and these tend to be the foods we over consume. When this is done on a regular basis, we find ourselves in caloric surplus and we gain weight. Coffee doesn’t have calories, but it is now providing a greater flavor reward stimulus than ever before. There have been times when I’ve cut back or even taken a break from coffee, but the flavor stimulus which I loved at that time is now more intense. A month ago I presented my plan to lose weight in a way that tested food reward theory. I haven’t made much progress, even though I am following most of the seven ideas very well. I haven’t been as good with #4, which is “Reduce snacking on non-exercise days” and #7, which is “Focus on making the most improvements on the pre-dinner meals.” I think the reason is energy regulation and possibly the high flavor reward I am experiencing with coffee. I’ll drink coffee for the flavor and pick up and then crash not later in the day, but sometimes as soon as 30-60 minutes later. At this point my energy level is low and I can’t drink more coffee, so I reach to food for the pickup. Coffee can be both suppress and stimulate appetite. In the short run, it suppresses, but in the longer time frame, I believe it increases my appetite. A week ago I decided I would delay my first cup of coffee an hour. The plan was to wake up and go outside for a walk before I started to brew coffee. I have failed to execute my plan even once. Despite the fact I am getting 8 solid hours of sleep, I go straight for the coffee as soon as I wake up. It picks me up and then slams me down. I need to tame the beast. Only the beast has never been stronger and more tasty. So I have a situation here where I am trying to reduce my food reward at the same time I am getting a very high flavor reward with coffee. And I am using food to help stabilize energy. I’m in a bad place. Hello darkness my old friend. Have you tried Pero before? It’s a caffeine free coffee substitute made from barley, malted barley, chicory, and rye. After noon, I avoid caffeine and switch between Pero and decaf coffee. Maybe a mug of instant Pero would help you delay that first cup of coffee. Just microwave some water and then stir in a scoop. @Aaron – I’ve tried various drinks that Pero and dislike them all. However, I do like the idea of getting a quality decaf coffee. Decaf coffee is WAY BETTER than it was even just 4 years ago. In December I toured the Swiss Water facility in Vancouver. A good roaster with Swiss Water decaf can make excellent coffee. No need roast dark with decaf anymore. What I have learned is that I can feel energized and great on both a low amount and a high amount of coffee. And I can feel run down and lethargic on high or low levels of coffee. I think what you’ve learned is that there’s a lot more going on in your body and life than just the coffee! Angelo Coppola over at “Plant Paleo” gave up coffee and uses it infrequently like a drug only when he needs a special boost. He says it works perfectly because he is not a habitual user. oops forgot to close the blockquote. @garymar – Fixed the blockquote. Coffee is such a huge part of my life that I would not want to go away. I need to find that balance though. Coffee for me has been similarly problematic. I feel like it is part of a vicious cycle where I wake up tired from poor sleep, then have a latte, then I’m wired then I don’t sleep well. The addictive nature is especially hard. I recently had vocal chord surgery as well as a diagnosis of acid reflux. I was off coffee for 6 days and thought what a great chance to quit for good. Then one day I got hit hard with the craving and there I am at the cafe getting a fix. The next day I was back and again yesterday. I am grateful not to have more serious addictions like alcohol, but man I understand a bit what it must be like. Additionally, there is that desire to recreate the feeling you get when it all lines up and you have some coffee and it makes you feel great. Unfortunately the next time it doesn’t work that way, even though I hope it will. In an interesting aside, I dreamt about the younger you kid pictured in the sombrero last night. I was riding my bike too fast and you were running down the sidewalk and I passed too close and you yelled at me to slow down. Needless to say that picture is awesome and you look like you were a great kid. Thanks for always writing cool stuff! Good luck figuring out the best path forward with coffee. @Matt – Funny. I want to yell slow down to the people in the gym slamming the machines with 1 second reps. I have found that caffeine depletes magnesium and I think this causes the negative loop. I have a love/hate relationship with coffee too. The habit of making it first thing in the morning is almost impossible to change. I can try to change my later intake, but that first cup of caffeine is almost a default setting on waking. Using magnesium chloride oil on skin daily in the morning seems to be the most efficient way to get magnesium back into the body, I have recently started doing this again and it works for me. I kinda have the same problem with coffee, although it’s not the reason I have a weight problem (by the way, I’m reading “Low Carb Myth” that I bought after your article about it, it’s a really good book, thanks for the discovery). 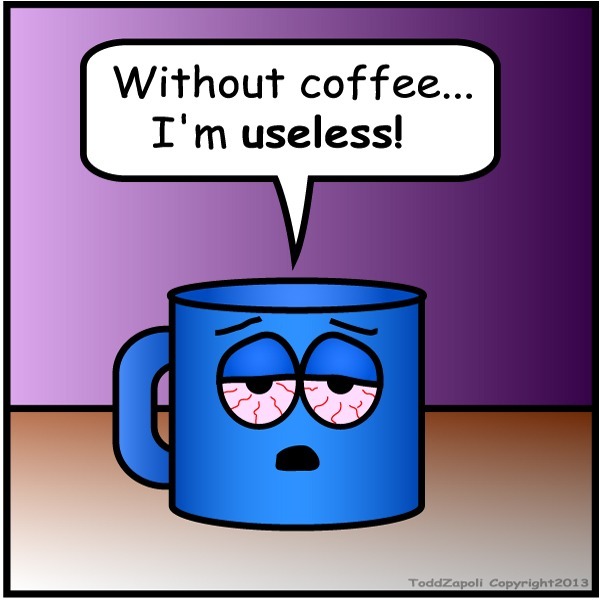 I did reduce the quantity of coffee I drank, mostly by replacing it first with tea. First with strong flavored tea, then more light flavored tea. It’s not perfect but it helps, especially if you can get some good tea. I just want to add that I think magnesium oil applied earlier in the day definitely improves my mood and energy levels for that day. Since applying it daily my mood, energy and just general coping seems 100% better. Nothing else has changed. It has to be the magnesium. I have a feeling magnesium makes all the other brain chemicals and hormones work more efficiently. My partner swears that magnesium has been a miracle cure for all kinds of things for him from mood, energy to healthier skin. He has been applying magnesium chloride (we mix our own solution with pure water, its cheaper) for 2 years now. Once your body has enough he finds you only need to apply it every second day. He also takes magnesium malate as a supplement. Your note that caffeine can stimulate and suppress appetite is interesting. My first cup with milk/sugar is all I have for breakfast and I can go 3 hours or more without eating. The second cup I have around midday with a light lunch and I find I get quite hungry around mid afternoon which must be the later appetite stimulating effect. Interesting. The word I forgot to mention was Resilience. That’s how both my partner feels since using magnesium regularly. More resilient. I have noticed a big difference in him and can attest to this. @Pauline – When I moved from Seattle to Silicon Valley, I stopped taking almost all supplements. I was packing light and decided not replenish my staples. Even magnesium. What I noticed is that after stepping away from magnesium was that nothing changed for me. My sleep was still awesome. These days I take a little Natural Calm maybe 2x a week. I notice no difference. I’ve never taken a topical magnesium. When it comes to which version of magnesium to take, I settled all the debates myself by getting a comprehensive one and then changing it whenever it came time to buy more. What about Matcha – does that do it for you? It’s interesting that coffee has become almost burdensome for you in California. When I lived in Portland, I had to have coffee at least 4 times a day. I live in New Orleans now, and simply the increased sun exposure has made me less coffee-dependent. There’s also the availability issue for me: in Portland, a cool coffee house sits on every block; in Louisiana, you have to deliberately seek out a nice coffee house. @Rita – I love green tea and have had decent matcha before, but it isn’t that tasty. Weather is not an issue. Right now it is the ever increasing quality. There are many reasons why the best coffee comes out of the Pacific NW. Weather is one of them, but that is a full topic itself. For me, I need to treat coffee like training – include planned deloads and random rest days. What happens otherwise, is that, like training, I start feeling really good, increase my intake and then crash. Usually if I have a deload week or two, and throw in the occasional days off, then I feel okay. Like another commenter mentioned, it’s more than coffee. I would wonder if part of the issue with going straight to the coffee pot in the morning is the ritual/habit of making it every day. I wonder if you heated water for tea or heated broth if that would help with the ritual part of it. Also, drinking a hot drink may offset some of the craving for coffee. My husband, who gets up before me, makes coffee in the morning and brings it to me often before I get up (I’m spoiled). If he is not here and I’m being lazy I’ll fix a cup of tea and I find that is enough for me. @Char – I agree. So after this post I went out and bought a high quality decaf (Ritual) and had a single mug. It had the effect of waking me up a little without the jitters and crash. This trick helped me drop my morning caffeine coffee intake to just 1/2 mug. Then I paired another 1/2 cup with lunch and 1/2 to 1 mug around 3 PM. When I visit my parents, I am offered Folgers. Maybe consider drinking untasty coffee? Or go camping, or to stay with friends who don’t drink coffee. You can get/make coffee, but it will take time and effort.